Battlefields and Warriors: 1 Hour Wargames an initial look. 1 Hour Wargames an initial look. One-Hour Wargames by Neil Thomas, published by Pen and Sword Military, is essentially a gateway to easy and fast play figure games, using a set of nine rules covering nine periods but with each set substantially sharing the same system and each only having around three pages of text. 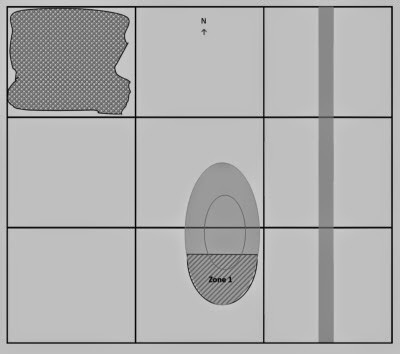 The book then has some 30 scenarios, described with simple layouts, intended for a 3' x 3' game area with units typically having a 4 - 6" frontage. So the mission of the book appears to be to get gamers playing with minimal rules overhead in a small playing space with relatively small forces, with games completed within the hour - What's not to like? I expect this to be the first of a few posts that I make as I explore the rules further. Please click the 'read more' tab for the rest of this post. Writing simple rules is a difficult task - just exactly what do you leave out? and at what point do you say that colour, feel, realism, satisfaction, subject integrity and credibility has been compromised? This line is probably in different places for each of us and looking at the Amazon UK reviews, there are users embracing the design ethos of the author and others less sure. The rules are something of a tightrope walk between the two perspectives of complexity and generic, but one feels that the target audience will be people who already have some figures but perhaps lack the time to get involved with long rules or to get a game onto the table or perhaps they just want to get the kids involved at an easier level - therefore the rules for this audience need to at least be able to offer the sense of a 'proper' wargame. Has the author pulled this off? The book advances through the different military periods, offering a set of rules in each section. Each ruleset is around 3 pages long and has minor modifications to fit the authors view of the period. The rules are paired with a sort of designer notes section of the same length. If you were to look at just the rules, you might say 'but what about .... (insert your doubt here)' but the design notes are often covering those exact same points, so you know the author has considered the matter and then given his rational for his design decision. This helps in accepting some of the absences and also gives one pause to wonder whether we have just become enslaved to accepting over engineered rules - without questioning their additional benefit or effect at the end of the day. Overall I think that a gamer with a favourite period and good knowledge of it, is likely to feel that the particular rule set in Neil's book does not do their period in question full justice without some additional tinkering. I actually see this as a strength of the rules. They offer a solid platform that can withstand modification to give a game that the user prefers as being their version of realism v complexity, while still staying within a very playable format. Importantly, it must be kept uppermost in the mind that there are loads of rules out there that offer greater realism and therefore complexity - the reason for using these rules is that they attempt to do something different and if that means midweek after the evening meal you get a quick game on the table and just enjoy it, maybe in a another period to your main stuff - then it seems these rules have fullfilled much of their purpose. If they feel too light, then I don't think you can criticise the book, you just need to look for something else. It is difficult to see how the author could have gone any lighter and got away with it and in that regard, the work can be thought of as cleverly conceived. Within the first few pages of the rules you come across this sentiment [To quote] 'Readers should always bear in mind that simple rules are not necessarily unrealistic, which all too common misconception has resulted in some monstrously turgid and hideously complex rule books being produced in the name of realism'. This just made me smile and instantly want to read on with increased enthusiasm. You may be surprised at neither a command or morale system being present and perturbed by only being allowed four unit types in your armies (where are the machine guns in your WWII armies or chariots in your ancient armies you will cry) but the hack and slash nature of the game fuelled by the simple cycle of manoeuvre and attack, against a game clock of just 15 turns, does carry the game along and before you know it, you are through your first game.... without having to pick up the rules during play! At the heart of the rules is a combat system that has the attacker roll a D6, which can be modified by -2, zero or +2 depending on attacker type and the result is the number of hits (protection can halve hits). 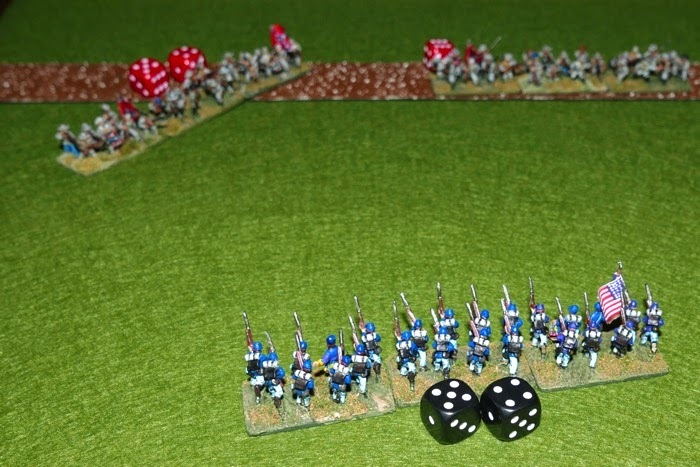 Units absorb hits until after getting 15 hits, when they are removed from play and so it is a game of attrition, with luck playing its part more than some will like. Anyway, enough rambling, what this post will be doing is to use the rules as written to get some play going and later posts may look at any tweaks and changes that I make to get closer to the game that want to see. The book does offer 30 scenarios for Red and Blue armies and is reminiscent of teaser type scenarios. I think some gamers will get full value from the book just in the scenario section alone. Although WWII is my favourite period, I will avoid that for now, as I think the changes I want to make there are big enough to require some consideration and play testing. Instead, I will go to the American Civil War set and play a game as written and intended by the author. Scenario 25 has been selected. This is the schematic map taken from the book. Overview - A small blue force has penetrated enemy (red) lines. It aims to plunder the red army's supply network before they can react. The red army has 6 units and the blue 4 units. The game lasts for 15 turns and the blue army always go first. Deployments - Red, 1 unit in zone 1 (the hill) facing south. Blue units do not start on the map. Turn 1, all 4 blue units arrive from the southern edge within 12" of the south-western corner. Turn 3, reds, 2 units from the northern edge. Turn 6, reds, 3 units from the southern edge on the road. Victory conditions - blue must exit 2 units via the road on the northern edge. Anything else is a red victory. My table - This reflects the simple terrain of one road, hill and woods. The terrain does feel a bit open and exposed for a typical ACW game. 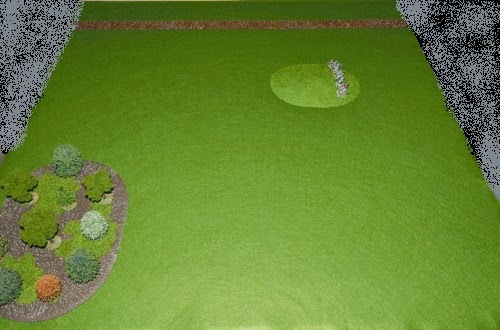 Notes - The rules say units will be formed from bases to give each unit a frontage of 4 - 6 inches on a 3' x 3' table. I am going to use 10mm Kallistra units formed from 3 bases, each with a frontage of 40mm (120mm in total, so almost 5"). Red forces will be Confederate and Blue will be Union. Rolling on the randomised 'Force Table', the Confederates get 3 x standard infantry units, 1 x artillery unit and 2 x Zouaves units. The Union get 3 x standard infantry units and 1 x Zouave unit. 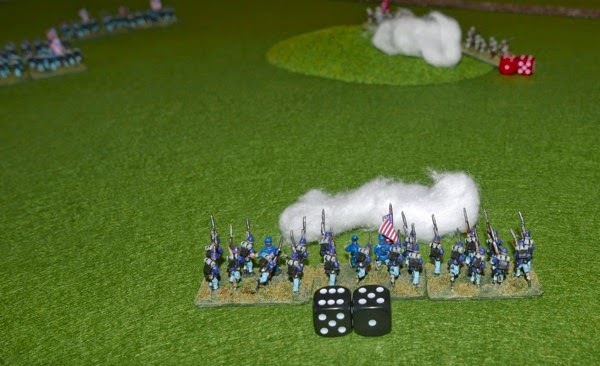 I do not have any Confederate cavalry and my first roll on the table, had them as part of the force, so I re-rolled. In the ACW ruleset, cavalry are fast moving 'shooters' they cannot engage in melee. They probably crop up too often on the randomiser table - but it feels okay within a set of scenarios that remind me of those 'teaser' type scenarios that crop up in wargame magazines that hark back to my days of playing to the rules and designs of Charles Grant. The system always delivers 4 unit types. That can feel a bit strange in say the Ancient period, especially when something like chariots are not represented, but in ACW, it's not so out of place. We get standard infantry, generic artillery, Zouaves and cavalry. Note Zouaves is actually just a general term to represent elite infantry, so you could put your Iron Brigade etc on the table when Zouaves are called for. I will just use double flagged units as a reminder as to which units are elites. In the preceding rules in the book, Pike and Shot are the last set that allow everyone to engage in hand-to-hand combat. The following Horse and Musket (so includes napoleonic) and Rifle and Sabre - (Europe 1860 - 1900) rules, limit melee to just cavalry actions and by the time we reach the American Civil War, melee is not allowed by anyone - firepower has become the dominant means of delivering attack. Units have a fire range of 12" except artillery can fire out to 48"
Units are removed from play once they acquire 15 hits. This is 3' x 3' table and it feels a little sparse - I have an urge to fill it! All 4 Union units enter the table in the bottom left corner (south west). The Zouaves move the fastest (9") so they are out in front, making a direct line towards the enemy board edge where the road exits. They are followed by two regiments of line infantry (who can move 6"). The 4th Regiment (on the right) moves towards the hill to engage the Confederate regiment. The Union plan is to reach the exit road as quickly as possible before the enemy can consolidate in that area. 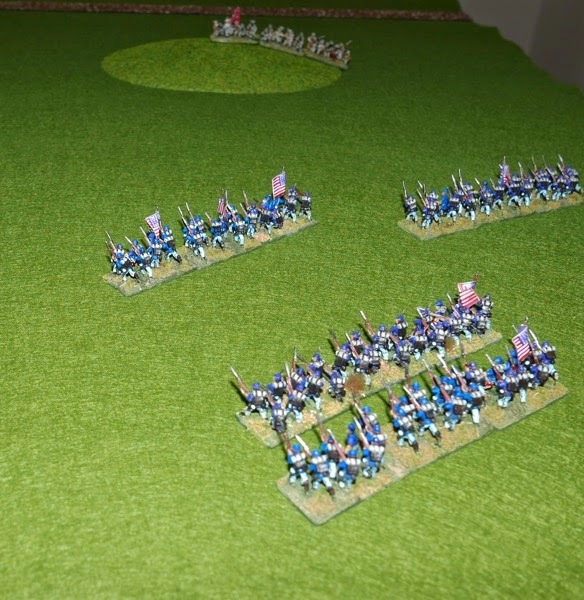 EDIT - I actually made a mistake here, the Union units should enter the board on the SOUTHERN edge within 12" of that corner, I allowed 3 of the units to come on the western edge within 12" of that corner. I doubt it would have really mattered - but it is worth correcting. The Confederates on the hill pivot in place, ready to engage the 4th Union regiment on the next turn. The Union Zouave really start to pull ahead. On the far right, the Union 4th regiment is within 12" of the hill, so they don't move and fire instead. They roll a 5. There are no modifiers, this puts 5 hits on the Confederate regiment. It will be removed from play once it has taken 15 hits. It fires back at the Union, inflicting 3 hits. The Union Zouave have got a little too far ahead, so slows down while the two supporting regiments catch up. The firefight at the hill continues. Zouaves block the road at the exit point. 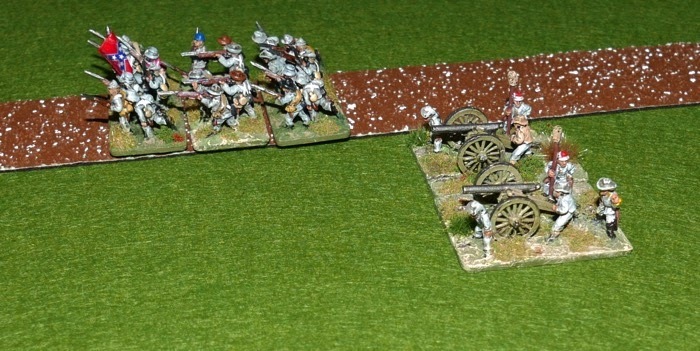 The Union Zouave unit stands and fires, while it waits for the supports to move into position. At the hill, the Union 4th regiment has accrued 11 hits so far, so might not around for much longer. At the hill, there is a slight surprise when the confederates reach their 'elim' figure first and are removed from play. The Union regiment is still holding on, but with 13 hits, it is very fragile. At the exit point. One Zouave unit inflicts 6 hits on the Union, but the other Zouave unit realises that it is just beyond rifle range, so uses the turn to edge forward a little. It now cannot fire this turn because it has moved. The rest of the Confederate reinforcements enter the board this turn - all from the south. One infantry unit arrives on the right flank of the failing union 4th regiment. Another infantry regiment takes to the road (to get the bonus move of 3") to try to get to the point of crisis faster. The Confederate artillery deploy, they have the range to support the Zouaves at the road exit and they are to the right of the hill, so don't have any visual obstruction (although the game does not have line of sight rules, I found myself automatically taking that into account). At the exit point the combined firepower of the two Confederate Zouave units see the Union Zouave unit off. It now looks very difficult for the Union. Their deployment means the rear unit cannot fire (see below) - what was I thinking? (in some systems, the second regiment might count as a support to the first - and this is a good example of some of the moments that make you stop and think of what is and what is not in the rules and thinking about the good and bad of that - it is thought provoking). Even as they manoeuvre apart, there remains a slight overlap and I feel that this should stop them targeting the left unit (from the viewer). Each regiment therefore fires at different targets, while the return fire concentrates on one - this is looking pretty obvious how this is going to pan out! The Union cannot afford to move, because if they do, they will not be able to fire in the same turn. Perhaps they should have pulled back out of enemy rifle range and sorted themselves out. At the southern end of the board, the Union regiment is finally overwhelmed and removed from play. 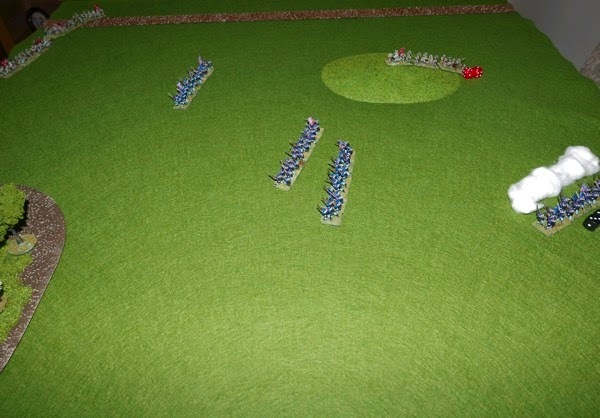 The artillery joins in the discomfort of the Union troops at the exit point by firing into their flank (there are no modifiers for flank or rear attacks, but the artillery fire is always reduced by -2, so sometimes their fire is totally ineffective). Everybody fires and the casualties rack up further. More fire, the +2 modifier bonus on each of the Confederate Zouave units is really starting to tell. Even though the right Union regiment is taking fire from an enemy infantry regiment and artillery, those fire dice have been poor and casualties therefore relatively low - but the regiment on the left is in a much more sorry state and the Confederate Zouaves finally remove that unit. Down to 1 regiment, the Union player can no longer achieve the victory condition. We hang around for one more turn to see how things play out, but it is surrounded now by five different sources of fire, including the regiment that is approaching its rear right flank. 5 hits from earlier combat, but that won't matter at this point in the game. The final Union regiment succumbs to fire and is removed from play. Game over - 4 turns earlier than the scenario allows for! 1 - The Confederate overwhelms the Union regiment and then advances to the rear of the enemy. Conclusions - well, what to say? I find myself having to sit down and carefully come to some conclusions, rather than just throwing down initial thoughts on paper. My gut reaction was to think that I had enjoyed the exercise as a quick fun game and did mentally put some effort in, trying to work out the best place to put troops etc - but I did not really get a level of satisfaction in the way that I would want from a wargame. It felt it was luck based and there was a sense of not caring about units as they are ground down, as long as you have enough to troops to achieve the scenario - I think I might care more perhaps if they had to pass morale checks (that might cause something mild such as wavering) or some command / activation rules, so that there were extra things in the system that actually mattered between having zero and fifteen casualties, rather than the system just running off a casualty accumulator. But then I have to stop comparing this action as to how another set of rules might have played out and remind myself that these rules are totally unique in what they try to achieve. I re-typed out the rules onto A4 paper in large font and only ended up with two sides of rules. The reality is that considering that level of simplicity and accessibility, it gave a good game, with an element of a teaser scenario to crack. The book covers a full range of periods and situations and even within each situation there will be differences. Imagine if the forces drawn for this battle had less Zouave types and extra artillery or even cavalry, it would have given the scenario a very different dynamic. I did put the game on the table at a time when domestically it simply would not have worked to have a longer game out and in that regard, it did exactly what it was meant to....... and I do feel like playing it again, so that I can better solve the puzzle of the scenario. The Union did not really deploy properly to get maximum effect of their own firepower and there was enough time in the game to make a better approach towards the exit point. I like the scenarios and would perhaps like to see another piece or two of terrain randomly generated to make the game table look a bit better populated, so next time I might add some fields and fencing, though make it that they have no effect on movement or fire - they would simply be a visual thing to enhance that aspect of the game. The scenarios themselves would be a useful game generator for a player to use with their own favourite rules. As for the rule system itself, I would like to tweak and add some things in, which would still keep things simple but just take it to a level that I would find a bit more engaging - this of course is a very personal thing and if 5 people tweaked this game you would almost certainly get 5 different levels of complexity. I liked the idea that at the start and/or the end of the movement phase, the player can pivot the unit on it's centre axis. It removes a swathe of 'wheel turning' rules. The only thing I added was to put the unit into column when moving up the road for visual effect - I used the pivot principle for that, deciding that if part of a unit was on a road at the start and/or the end of the turn, the unit could automatically deploy into column or line as necessary, accepting that it was just for visual effect rather than changing the mechanics of the game. It is a solid system that can take tweaks quite well and it has stimulated my mind to thinking that perhaps some of what we do anyway is over-processed. The interesting thing is, there are already rules out there that do the things that I might want to do - the point of this book is that it is different and it fills a gap that needed filling. I can see the book being a useful source of scenario generation and giving a game in which two friends (or solo) are comfortable with an easy play set that they have adjusted to their own ideas of how the period should look and play out. Now that I have packed the game away and am sitting at the keyboard reflecting on what actually happened and the way that the scenarios are presented, I feel an increasing appreciation for what the author has done. The rules do what they are supposed to do and there is scope for adding bits in. There are moments in the game that the practiced gamer in you asks a question, such as when firing at a unit in woods, how far into the woods can you see? and how do woods effect line of sight? why does moving through a wood not impede movement? How much of the target has to be visible to the firer? etc. The fact is that the rules do not cover these aspects, so you either draw on your gaming experience to make a decision or you just go with the rules on the basis that if 'if the rules don't stop you, then you can do it' - so you can shoot as far as you want into woods ..... though by extension that might suggest you can fire right through woods out through the other side and I doubt any of us would actually want to see that. So in some respects, perhaps these rules can be very brief because we can fill in some of the gaps without really thinking about it. Overall I am left feeling that for my own pleasure, too much has been stripped away. I certainly do not want a lot of rules in my games and these days favour light systems anyway, but these rules on their own are not enough to scratch my itch. Even a little command chaos, so that everything couldn't do exactly what the player wanted each turn would help (although the chance cards suggested in the solitaire chapter offer some thoughts for such things). I remain intrigued of just how far you can take this process and still end up with a viable game. I will be happy to play some more, adding some bits in, the interesting thing will be whether I can add back in with the same elegance that the author stripped away. EDIT - I played the scenario again, only this time I halved all measurements, so the board was an 18" x 18" surface, unit frontage dropped to 2 - 3" (so I just used 2 x 40mm bases side by side for infantry and a single base for artillery), and all movement and fire ranges also halved, so 6" becomes 3" and weapon range drops from 12" to 6". I just made up a cardboard ruler with the new measurements on it. I did re-dice for the army structure and both sides got exactly the same units again! The game played out slightly differently with the woods getting used for their cover value, but the result was the same. 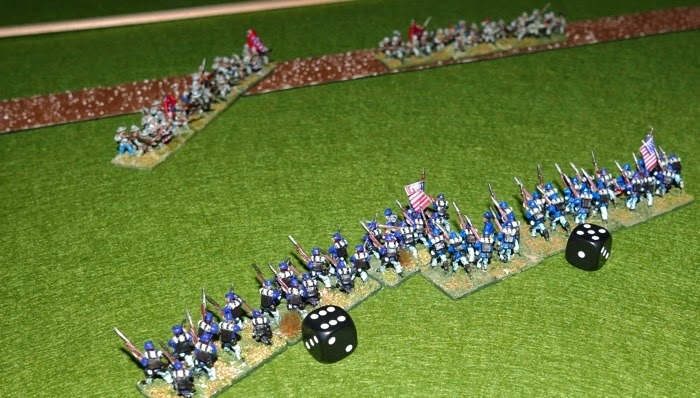 On turn 10 the last surviving Union regiment was removed from play. I have added this edit so that anyone with a very small playing area or few units can be encouraged that 18" x 18" will still give a viable game (and use fewer figures). and very vulnerable when Confederate reinforcements arrived. 2 - Union infantry move onto the hill, forcing the Confederate infantry and artillery below to stop and attack. The hope was that the other two regiments could make it off the board. Confederate regiments were left with very heavy casualties. 4 - Initially this Union regiment attacked the Zouaves in the open, causing a lot of harm, but as the last surviving Union unit, they tried to escape over the hill - but failed. Time - The scenarios play in under an hour - and often 30 minutes is all that is needed. Solitaire - This is a two player game that plays perfectly well solitaire. There is also a chapter dealing with solo play and it advocates such things as using dice to randomise the set up of one side and a set of chance cards - which is really just a variation on the Random Event Table idea. The idea of the solo suggestions is simply to loosen the players grip on the game and inject some chaos. Complexity - very low, justifying 1 on a scale of 1 - 10. Space - The games are designed around a 3' x 3' board and really you could put any scale of figures on the table. Unit frontages are 4 - 6". so you could shrink all of this to a 2' x 2' board and have frontages at 3 - 4" and movement/ fire ranges reduced by 1/3. Off table space is not really needed. EDIT - note the recent 'edit' added just a few paragraphs above here in which a game was played in an 18" x 18" space. Resources. I would recommend that readers visit the following blogs of people who each have a thoughtful approach to their gaming and are in the process of gaming with these rules. I've also managed to play the scenarios on a 9" x 9" board using 6mm figures on a 1" frontage. I even played a couple of scenarios (using my own rules it's true) on a board on my lap when I went camping a few weeks ago. I forgot to add that I am playing through and documenting each of the 30 scenarios in order as the mood takes me. You an read about that HERE. Thanks for the report! I find the book very inspiring, I bought it for the scenarios as I love scenario books but I found that I like the whole approach, although I haven't tried the rules yet. But your report makes me want to give them a try! Excellent analysis. I agree with you - while the rules are admirable, they seem to have stripped away stuff that makes gaming fun. As a game it is great, but as a WARgame not so much. For me I think it is trying to blank out 40 years of wargaming experience that has conditioned me to requiring certain level of detail in a wargame. I think if I was coming to wargaming without this context, the rules would be fine. 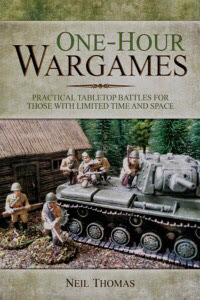 I just got this book for my birthday, and I'm not an experienced wargamer, mainly because I never have the time, space, and spare cash to invest in it. So it's serving its purpose for me very well. But one thing the book neglects is bookkeeping. How do you guys keep track of up to 15 hits for each of your units? Do you assign them names/numbers and just keep a separate tally sheet, or what? 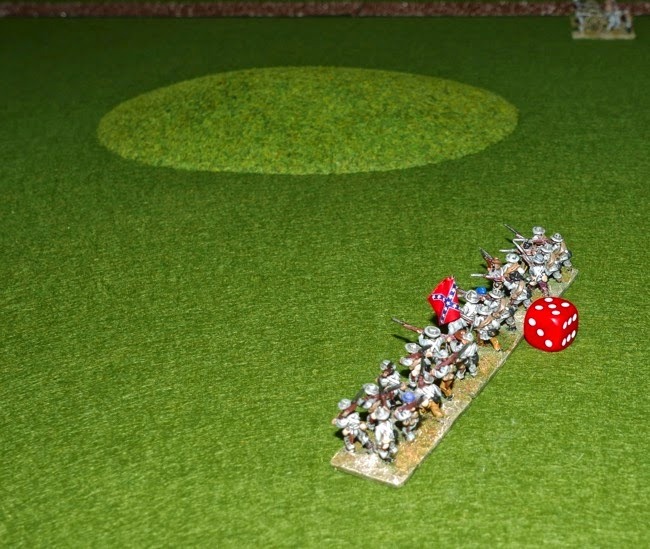 Hi, you could sign numbers / names etc and have a roster sheet, but I play quite a lot of solo play and for managing two sides, I would just rather have the visual effect of casualties shown on the actual table - so, I have a bunch of small dice (red and black) and as units take hits, I just use the dice values, by placing the dice behind the units to show the current hit level. I have seen some wargamers use a short length of coloured pipe-cleaner to denote casualties. Just lay the pipe-cleaner on your figure base. Everything to the right is considered a casualty, as more casualties are taken, just move the pipe-cleaner further along the unit - it does mean of course that you need at least 15 figures in your unit :-) or use a different coloured pipe-cleaner once you get past say 10 hits. Even though you have discontinued the blog I still keep coming back to your posts that I have not read yet. Great looking game. Despite your reservations here it looks like you kept at these rules. Dale, thank you for continuing to support the blog. The rules continue to interest me, though in the back-ground, I have my own hex rules that are a work in progress, which I will share at some point.